“Disco will never be over. It will always live in our minds and hearts.” So begins Matt Keeslar’s final speech in Whit Stillman’s The Last Days of Disco. While the death of their club and the dawn of the Eighties spelled the beginning of the end for the Doomed Bourgeois In Love, disco’s fate, it seems, was far from sealed. Enter Fitness Forever with their second album for Elefant Records, Cosmos. After their first album left frontman Carlos Valderrama empty, as he describes it, the band were left with ample room for stylistic exploration. In time it seems, the band took to mining a vast depository of ’70s music for inspiration. The result is an album that has more than one foot (let’s say one and a half feet) firmly planted in the disco era. But John Travolta, this is not. Cosmos, while a disco record in spirit, is more stylized in practice, marked as much (or more) by the metered cool of bossa nova as the licentious revelry of Studio 54. While Cosmos is an album very much at home in the musical landscape, it’s not the sort of record to settle down in one place for very long. While numbers like “Disco Quiz” and the title track may be the most reminiscent of the last days of disco (well, I say “reminiscent,” but then, I’m not really chronologically qualified to reminisce about such things), tracks like “L’amore Annegato” play it closer to the ghost of Getz/Gilberto that haunts the whole of Cosmos. One would even be forgiven for comparing songs like “Hotel Flamingo” or “Le Intenzione Del Re” to latter-day Belle & Sebastian. At its heart, Cosmos is driven by a loving embrace of an amalgam of influences: lush instrumental textures straight from late ’70s radio, shuffling rhythms and intricate jazz progressions, and bossa nova inflection. It’s enough to send Ted Boynton awkwardly cavorting his way across the dancefloors of Barcelona in pursuit of plain-looking girls. At the end of that speech from The Last Days of Disco, Matt Keeslar’s character Josh declares, “Disco was too great and too much fun to be gone forever. It’s got to come back someday.” Whether that’s a part of his impassioned speech that Josh “actually believes” is irrelevant, because, if Fitness Forever’s latest is anything to go by, that day is here. A few days ago, in an attempt to find something new to listen to in the car, I pulled out a few Brazillian bossa nova CDs I grabbed when Tower Records closed it’s Chicago stores in 2007. I loved them at the time, but, to be honest, I haven’t really given them a second thought since June of the following year. Now, I don’t put much stock in these things (even if I did watch My Dinner With André last night), but when I opened my email the following morning to find a trio of new Elefant EPs, including the newest single from Giorgio Tuma with Lena Karlsson (Komeda), it was almost as if my sudden inclination to revisit my post-collegiate Latin leanings was meant to prepare me mentally for the present single. The two-track EP is the Italian songwriter’s third Elefant release and reflects strongly the instrumental influence of Latin jazz, Sergio Mendes, and the various Gilbertos with seventies soul harmonies and the glitchy charm of Stereolab. Also currently available from Elefant is a 10-inch mini-LP, If Words Could Kill, from Leicester indiepopsters The Silver Factory, a follow-up to their first EP released on Elefant only a few months earlier. The band, though named in honor of Andy Warhol’s pop arthouse, is far from a rehashed Velvet Underground. Clearly rooted in the British Invasion (see “I’m Alright”) is likewise decidedly steeped in ’80s indiepop (Close Lobsters; Soup Dragons). Really, it sounds like the kind of record you might expect to find on Matinée (which is just my subtle way of saying that this is the sort of thing that will appeal to fans of Math and Physics Club). Drop the needle on this one, and it’s only a matter of seconds before you’ll feel the overwhelming desire to don your favorite wool jumper and stare at your shoes. While I think it has been fairly well-established that a great many Elefant releases will ultimately prove to be something special, occasionally, a release leaves even me stunned. Try as one might to write them off as just the latest in a string of girl groups built by male songwriters to recapture the ethos of a bygone era (e.g. Monster Bobby and The Pipettes), there’s something particularly irresistible about The Yearning. Created by songwriter/producer Joe Moore, The Yearning’s aptly titled EP, Jukebox Romance, was recorded in a cupboard underneath a staircase in Moore’s home. But where other such groups with similar origin stories seemingly aim to conjure up Spectoral shades, The Yearning recall a time when mad old Phil was just another Teddy Bear. So much so, you half expect singer Maddie Dobie’s boyfriend (no doubt the spit of James Dean) to hop on his Triumph and go skidding off of Dead Man’s Curve. In fact, the legendary screeching tires sound effect even makes an appearance on “Boy Racer”. In fact, for the most part, Jukebox Romance is doo-wop down to the “shoo-wop-doo-wah-oo” background vocals and spoken interludes, right up until the moment “Don’t Call Me Baby” has a passionate fling with a James Jamerson bassline. (And all of it with that misty hue you find wherever British artists adopt American vernacular styles. *) Where The Yearning are concerned, I think the first track on Jukebox Romance says it best: “You Make Lovin’ You Easy” and I can’t exactly say why (—well, I probably could, but that’s a topic for another time). Jukebox Romance is available now from Elefant Records. *This is not a bad thing. It’s not even easy to explain. It’s just what happens—sort of like the way every time Americans touched C86, it turned into grunge. I’ve been hearing rumblings about new music from my old friends The School for almost a year, and now, finally, the time has come. A single, along with a whale of a cover designed by drummer and Bubblewrap Collective-ist Rich Chitty, is due out from Elefant Records on 26 March. Over the course of four brand new tracks, we find the band, still champions of the piano-driven 60s pop that dominated their 2010 debut LP, Loveless Unbeliever, exploring new sounds which build brilliantly on the aural textures established in their earlier releases. These added dimensions are most prevalent on the A-side, “Never Thought I’d See The Day”, in which a digital organ takes up where the piano left off, a move that will please fans of Hollows and The Like. The organ gives the song a more full-bodied feel, while danceable rhythms and Liz Hunt’s usual breathy vocals keep the track firmly planted in the indie pop world without going the full garage. “When He Kisses Me” and “Where Does Your Heart Belong” are more reminiscent of the Loveless Unbeliever days, though a recorder makes an appearance on the latter where, likewise, the trumpet is used to great effect (think Tigermilk-era Belle & Sebastian), while “I Wouldn’t Know What To Do” is a stripped down ballad that relies heavily on acoustic guitar and glockenspiel. 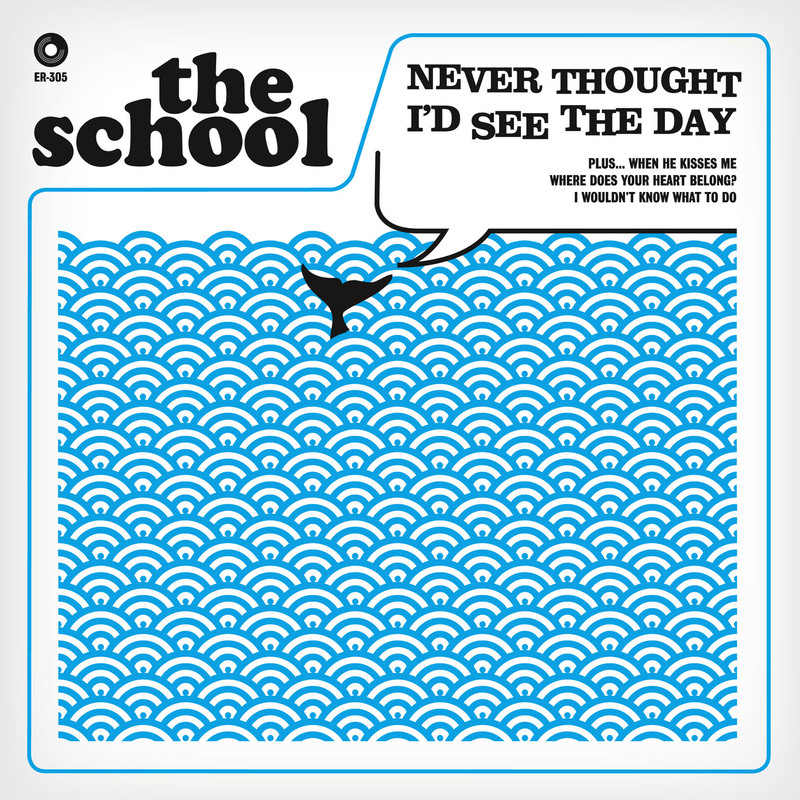 Overall, “Never Thought I’d See The Day” sees The School moving ever-so-slightly in a new, you might even say more mature and cohesive, direction, which is a promising development for band and fans alike. Speaking of which, you all know The Primitives are a thing again (and have been for a couple of years), right? Which is a good thing for me, because I’ve been spending a lot of quality time with their first two LPs lately and my list of indiepop bands who were dead before I knew them has grown so long, it’s a great feeling to finally be able to strike a name off that list. In April, the Primitives (now part of the Elefant roster) will release Echoes and Rhymes. The album, featuring 14 covers of somewhat obscure female-fronted acts from the 60s will be the band’s first LP in over 20 years. If you’re a longtime fan, then no doubt you’re already feeling a twinge of excitement. But if you’re new to the Primitives, pick up their RCA LPs if you can find them (they are, I believe, out of print now, but I see affordable used copies of Lovely and Pure pop up now and then in the better indie record stores). Either way, get listening because (and this is the best part) The Primitives and The School, will be playing a handful of UK dates together this spring. And I think we all know how great those are going to be. Further details and ticket links can be found on the Elefant site. It pays to check out your Twitter followers (and I don’t mean that in the police state paranoia way or creepy leering sense). But, really, it’s not a bad idea. Not only will it save you from a robot army wielding free iPads, but sometimes it puts you in the path of Spanish shoegazers brandishing guitars and powerful fuzzboxes. Such is the case with Los Bonsáis. It only took about 30 seconds of “Es Mejor” for me to know that I had stumbled onto something I really loved. With their subtle, melodic vocals, it’s easy to place Spanish duo in the same camp as My Bloody Valentine and their variously fuzzy descendants, but the 60s surf inspired-inspired rhythms also owe a great deal to the noisier side of late 80s indiepop, like The Fizzbombs or Meat Whiplash/The Motorcycle Boy—or, in more directly relevant, contemporary terms: “like a Spanish Raveonettes” as a friend from another blog described it. Head over to Bandcamp to check it out, I think you’ll see where we’re coming from on this. (You can also download the “Es Mejor” b/w “Un Instante” single for free there.) Of course, if you’re anything like me, you are probably thinking something along the lines of “I’ll bet they sign with Elefant soon”. I was when I listened Sunday night. I spent a good amount of time this week thinking of all the arguments I was going to make in this week’s Indiepop’d piece for why Los Bonsáis + Elefant Records is a match made in heaven only to plug this post from the band’s blog into Google Translate and find that my revelation had come to me a few hours late. So the good news, for those of you digging the sweet noise of Los Bonsáis as much as I am, is that there will soon be a new 7” EP released as part of Elefant’s New Adventures in Pop series and one more disc to spin at your respective indiepop club nights. It would be redundant, at this point, to predict that “match made in heaven”. But it is never too late to celebrate a match well made.